You will be missing out if you don’t take a look this wonderful penthouse unit in an art deco building. Great location with shopping and dining within walking distance. 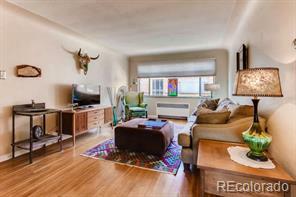 The unit and building have tons of charm with mountain and tree top views. There are two large bedrooms, hardwood floors, a newly remodeled bathroom, newer appliances with washer/dryer combo in unit. The seller has replaced the plumbing behind the walls and updated the radiator system. There are no shared walls (bonus!). Gated community with shared yard space and community grill. You will love this Park Hill gem!